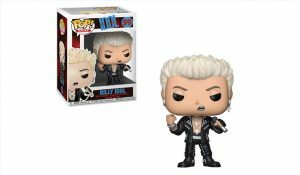 Funko, a company known for bringing to the market miniatures of icons of music and comics, has just announced the launch of a doll inspired by Billy Idol, icon of the 80’s music. In the official image of the new product, the singer appears with his characteristic closed fist (c’mon! ), Hair spiked and leather jacket. The toy is now available for purchase on the internet and joins other characters from the rock series produced by the company. Funko has already put collectible characters from artists such as Ozzy Osbourne, Freddie Mercury, Lemmy, Rush, and most recently the AC / DC dolls. Subsequently, he embarked on a solo career which led to international recognition and made Idol one of the lead artists during the MTV-driven “Second British Invasion” in the United States. The name “Billy Idol” was inspired by a schoolteacher’s description of him as “idle”. Idol began his music career in late 1976 as a guitarist in the punk rock band Chelsea. However, he soon left the group. With his former bandmate Tony James, Idol formed the band Generation X. With Idol as lead singer, the band achieved success in the United Kingdom and released three albums on Chrysalis Records before disbanding. In 1981, Idol moved to New York City to pursue his solo career in collaboration with guitarist Steve Stevens. His debut studio album, Billy Idol (1982), was a commercial success. With music videos for singles “Dancing with Myself” and “White Wedding” Idol soon became a staple of then-newly established MTV. I think that you could do with some pics to drive the message home a bit, but other than that, this is good blog. A wonderful read. I will certainly be back.